Expires in 4d . Last validated 1mo ago . Used 1 time. Lismary Jaramillo I am validating this deal woks as described. Just apply the promo code at the shopping cart and get 15% Off Your Order at Covet Dance (Site-Wide). NAZARET GOMEZ The code is valid. 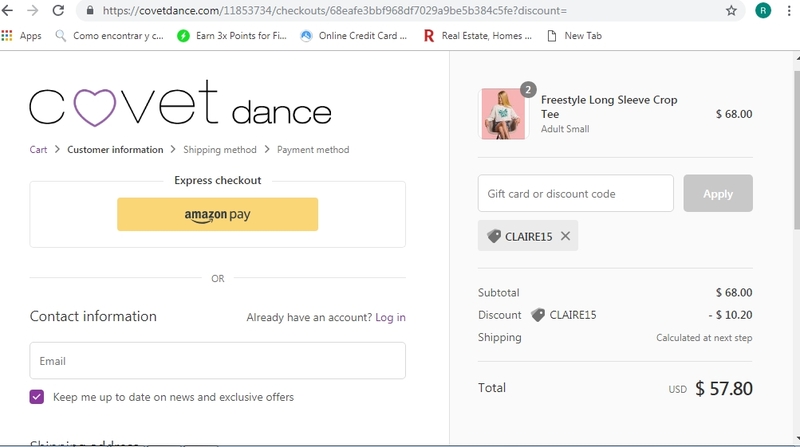 Good deal, add your item to cart, enter promo code and get 15% Off Your Order at Covet Dance (Site-Wide). Ronald Mata This is an amazing deal that works as described. Enter the promo code into the code box and click apply to get this discount.